Home > Settings > Emails > How can I use Automatic Alerts? How Can I Use Automatic Alerts? Automatic email alerts help you to automatically remind members about their next delivery, when the web store is open, and when another payment may be due. Alerts may be triggered IMMEDIATELY and sent to ANY member who meets the condition defined for delivery. For more tips about how Email Alerts can help you to manage your program, read on and check out this Tip of the Week. 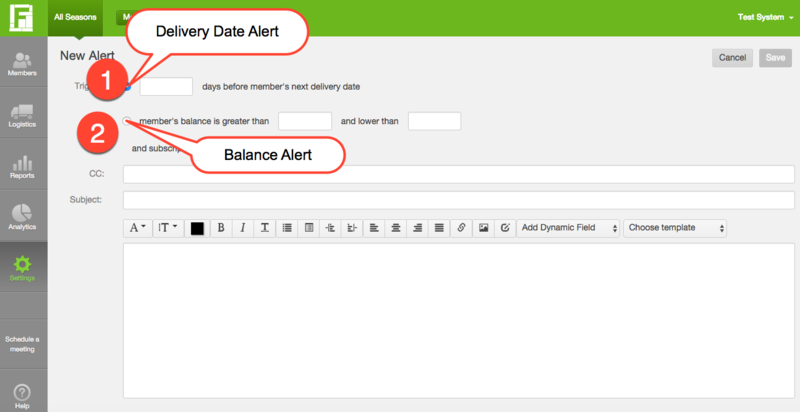 The Balance Alert type is only available for systems that have been set up for ongoing deliveries; this alert is not available for systems that manage finite seasons. If Guest Store Access is enabled for your system, members that only have the guest store access share and no pending store order will not receive the delivery date automatic alert. Click here to learn how a member may opt out of receiving alerts. 1. Delivery Date Alert: Enter the number of days before the member’s next delivery date that you want the member to receive this alert. The alert email is sent out at approximately 7:00am according to the number of days before members' next delivery date. For example if your deliveries are scheduled for a Wednesday and the delivery date email alert is set to be sent 1 day before delivery, the email will be triggered on Tuesday at 7:00am. To set a delivery alert for the day of delivery, enter "0" number of days before the member's next delivery date as the trigger. Please note, alerts will not be sent to members who are on hold and members who have guest access to the store but no pending order. 2. Balance Alert: This is the second trigger listed for ongoing configurations. Enter the lower limit of the balance range in the first box and the upper limit in the second box of the condition. You may create multiple alerts for different balance ranges in order to set up different types of reminders, such as one that notifies members when their balance is running low and is not yet negative. Balance alerts are sent once a week, before 8:00am Pacific time on the morning after the member's last scheduled delivery. The member will receive the alert every week as long as the balance falls into the defined range. These alerts will NOT be sent to members with an echeck payment in process. These alerts will NOT be sent to members who are on a permanent or temporary hold. 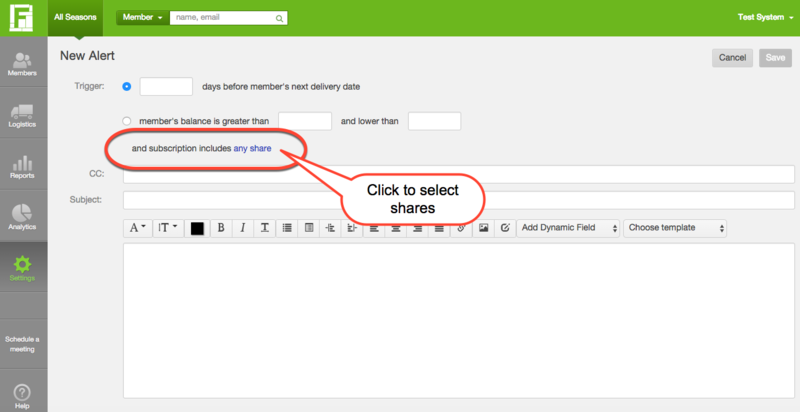 Use the subscription Filter to Select which members will receive the alert. 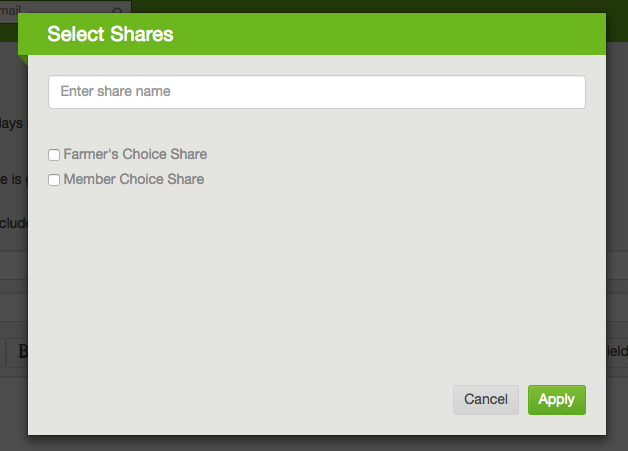 If a specific subscription is selected then the alert will be sent only to members which have this subscription. If more than 1 subscription is selected, then the alert will be sent to any members who have at least one of the selected subscriptions. To opt out subscriptions, use the filter to select all of the subscriptions except those that should be opted out. If no filter is added the alert will send to all subscriptions/members. 1. CC: If you would like someone to be copied each time that the alert is triggered, enter their email address here. You may enter more than one email address separated by commas. 2. Subject: This field is editable by you here. 3. Edit the content of the email here. 4. Save changes once you have finished editing your alert. It will be automatically sent based on the trigger that you defined. If you have an ongoing system, we recommend setting up a general balance alert email to keep members engaged and aware of their account balance. Below is example text you can use for the balance alert email. 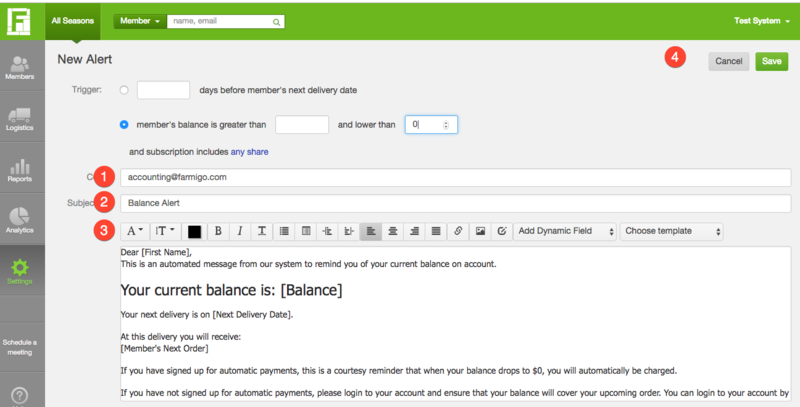 This is an automated message from our system to remind you of your current balance on account. Your next delivery is on [Next Delivery Date]. If you have signed up for automatic payments, this is a courtesy reminder that when your balance drops to $0, you will automatically be charged. Remember, you can also put your delivery on hold from your account if you wish!